Valentines need to be held to be appreciated. An e-valentine just isn’t the same. 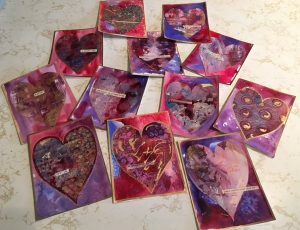 I love creating valentines and although I need to make many for my family, the production never looses it appeal. I was curious about who created the first mass-produced cards and expected it would have been Hallmark. What I discovered was another long-forgotten woman artist, Esther Howland. Howland created Valentine cards that went from a small scale of card sales to developing a flourishing company. Her small idea grew very big. Esther Howland grew up in Worcester, Massachusetts, where her father owned a large book and stationery store. She attended Mount Holyoke Female Seminary, graduating in 1847. One of her father’s vendors sent Esther an English valentine. Stylistically these cards were quite elaborate; they featured hearts and usually multiple layers of lace and added decoration. 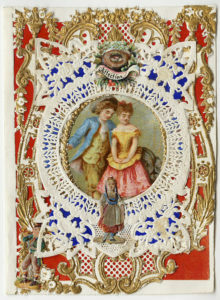 They were much more impressive than the simple cards used as valentines in the U.S. in the early 1800s. This gave Esther a great idea. She created a dozen of her own embellished cards and asked her brother to take them on his sales calls. 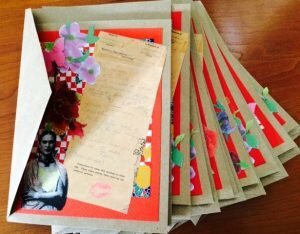 Esther hoped for $200 worth of orders and instead got $5000 worth of orders. She had expected to make the cards herself, but out of necessity came up with a new plan. She contacted her friends and set up an assembly line of card makers at her home, this predated Henry Ford’s assembly line concept by 50 years. She also realized the possibilities offered by “cottage industry.” She provided a finished sample and a box of materials to women who preferred to assemble valentines in their own homes. She would prepare boxes of supplies with the accompanying design template and courier them out to ladies’ homes around Worcester. After a week, a driver would pick up the finished cards and return them to Esther’s workshop for her final inspection. Eventually her company, New England Valentine Company outgrew her home and moved into a rented building in downtown Worcester. A simple Howland card sold for five cents but the price went up for the more detailed cards. A card trimmed with ribbons or featuring intricate artistic illustrations would cost more. Some of her truly elaborate cards were highly decorated sold for as much as $50. 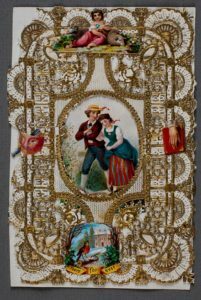 While Esther Howland may not have been the first American to go into the Valentine’s Day card business, she was certainly at the forefront of the industry. With artistic flair and natural business sense, she was able to create an all-female company. At its peak in the mid-1800s, annual sales were over $100,000—all at a time when few women were welcomed in the business world. 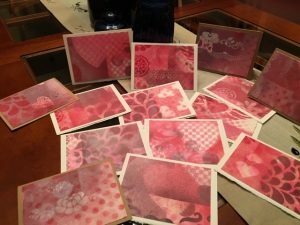 Thanks for reading and have a great time making your own cards for Valentine’s Day! If you want more information about Howland go to the American Institute of Graphic Arts website.